The farm as a workplace remains dangerous with high morbidity and mortality rates. While fatal injury has decreased, nonfatal injuries have increased annually. Long-term disability is significant. 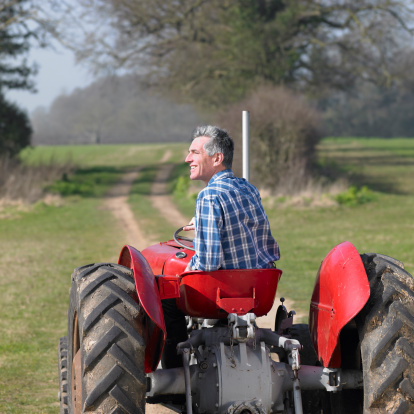 Though defective equipment design, insufficient manufacturer warnings and/or equipment malfunction cause many farm accidents, it is possible to reduce your risk of injury or death on the job by taking safety precautions. Loose clothing is a common cause of injury in agriculture. Most equipment has gears, pulleys and sharp edges that can easily catch clothing. As a precaution, wear tight fitting clothing. Keep cuffs buttoned and shirts tucked in. Make sure to not wear a tie while working and remove any loose jewelry. Keep long hair under a cap to prevent equipment entanglement. Power take-off (PTO) drives on tractors are extremely dangerous. Today’s equipment must come with appropriate guarding to keep moving parts shielded. Older machines, however, are normally not guarded. Additionally, many of the guards on the newer machines are bent, broken or have been removed. Remember to replace PTO guards and to disengage the PTO before leaving the tractor seat. One of the most dangerous farming operations does not even happen on the farm. It is driving or carrying equipment over state or county roads. When transporting equipment, always use a slow moving vehicle (SMV) emblem. Be vigilant in noticing motorists attempting to pass an SMV. In many cases, motorists will mistakenly believe the farm operator is turning right when he is actually swinging wide to the right to make a left turn. Motorists can mistake the initial right turn for an opportunity to pass on the left side and cause a collision. Use pilot vehicles to alert motorists and keep them from getting too close, and use two-way radios to communicate with the pilot vehicle. These are just a few of the hazards farmers face while maintaining and operating a farm. It is important to employ good safety measures to protect workers as much as possible. Unfortunately, if an injury does occur, assistance is available to cover medical bills, lost income, physical suffering and even emotional distress. Contact us today to learn more.